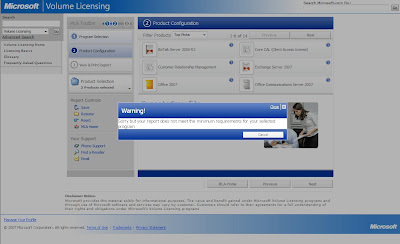 MPECS Inc. Blog: Microsoft Licensing - Upgraded License Advisor Again? 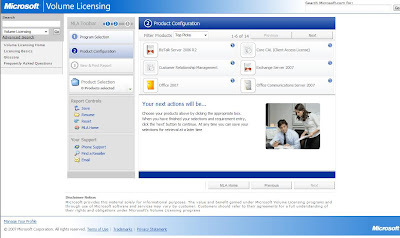 Microsoft Licensing - Upgraded License Advisor Again? A while back, Microsoft finally released the new Microsoft License Advisor. Up until now, the Advisor was working really well. We could choose the applicable Licensing Program and then go through and choose the needed products along with Software Assurance if needed. Today, we have a situation where a client with an existing Microsoft Open Value Licensing Agreement needs to add a product to the agreement. They are still in year 1 of the 3 year agreement. The first thing we noticed is that the interface has been changed. And, in our opinion, not for the better. List of products: 6 at a time! We have to keep on clicking the Next button at the top right of the products list to "scroll" through them. The pause in between each group of 6 is painfully slow too! Change the "Filter Products" option at the top left of the products list to "All", and we still only see 6 products at a time! At least with the previous License Advisor generation/version when we selected "All" we would get the entire list to scroll through with a Scroll Bar. The second referenced previous post above has a screen shot of the previous Advisor Web interface. Um, we are looking for an additional license here folks. Since the core logic of the Advisor is seemingly setup to meet the minimum number of licenses required for a new order, perhaps the question should be asked at the beginning: Are you starting a new Agreement today or adding to an existing one? "Yes" or "No". And, come to think of it, when it comes to Open Value Licenses, once it is established that there is an existing agreement in place, the question should be asked: Are you in the first, second, or third year of the Agreement. This would help to narrow down the part number results to the correct ones for the given year of the Agreement. Last week, I went thru the upgraded license advisor thinking "Hey, this new interface should be easy to figure out licensing options and costs, Cool." The interface is horrible, like some sort of weird beta. Why are the config screens so, so...tight? Do they think every administrator only uses a 3"x4" PocketPC screen for ordering?? The advisor kept adding unwanted software, which I valiantly tried to remove, and then it would purposefully grey out the items I did need. Sheesh. YIKES... $34,000 for 12 copies of XP Pro and Office..?? Where did I go wrong? Not long after that the website kicked me out and I had to start over. Instead I shook my head, walked away from it, mentally noting to call MS next time. Yes, the whole licensing thing is frustrating. The biggest frustration for me though, is getting 5 different answers to the same question when calling into the licensing centre. In some cases, the person on the other end of the line was the same one I spoke to previously about the licensing! We do a lot of Open Value and Charity licensing. By far, the most complicated licensing is Open Value. You can license over 3 years and make 1 payement for the 3 years. You can have 3 payments spread across the three years. You can add to your existing license in the second year. You can add to your license in the third year. Getting all of that straight, plus the part numbers, and nevermind Internet facing licenses for products like MOSS, really makes for a headache. So, for now, hopefully we can put a bug in the ear of the powers that be to make changes ... back to the way they were. The new Advisor's GUI was not broken. It worked. And, it was efficient. If it ain't broke ... don't fix it!